To me in elementary and junior high schools, it was my beloved library. To Civil War buffs, it is the site of the last capital of the Confederacy. To Danville, Virginia’s simultaneous pride and shame, the CSA headquarters for its final 13 days was in the mansion of William T. Sutherlin. How do you suppose the locals are taking the CSA/Confederate battle flag controversies? As you might expect, as shown in this piece in the city paper, the Register and Bee, here. Be sure to read the snarling leave-it-like-it-always-has-been comments from readers. The more measured gist of the article is that city officials checked with state ones to find that Danville has no authority to remove the flag without a change to state law. 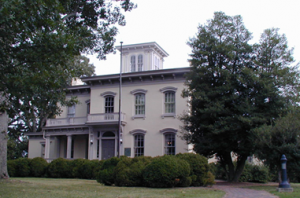 The mansion was a gift to the city, became its library, and when a new library went up, the building became a Civil War museum owned by the city and run by a non-profit. With all the changes came a new flag pole that the city designated as a memorial to Civil War veterans. Per this commonwealth law, officials can’t remove veterans’ memorials. ThinkProgress covers the whole mess well here. Stars and Bars worshipers say if the law doesn’t change, the flag stays up. Others are not convinced and hold that the base and pole may be the monument, but the flag itself is run up and maintained by a private group and is not covered. Blah, blah. They’ll resolve this, but it certainly is more difficult than it should be.